An exhibition entitled ‘Hadrian, Saviour and Builder’ is currently being held at the newly restored Fethiye Mosque in Athens’ Roman Agora. The exhibition, which opened last January, is being organized by the Ephorate of Antiquities of Athens. In the autumn of 2010, the Ministry of Culture ordered the emptying of the various antiquities stored inside the Fethiye Mosque and launched a renovation project. The building was built in the second half of the 17th century when Athens was under Ottoman rule. It is located in the northern side of the Roman Agora, and was built on the ruins of a Christian basilica from the middle Byzantine period (8th-9th centuries). From 1834 until the 20th century, the mosque served as barracks, a military prison and as a military bakery before being re-purposed as a storage place for the findings from excavations in the Agora and the Acropolis. The Fethiye Mosque is now operating as an exhibition venue for photography or antiquities. The newly restored Fethiye Mosque Museum in Athens. Hadrian had a deep love for Athens and the city received particular attention through his benefactions. He was a dedicated philhellene who admired Greek culture. He visited Athens on several occasions during his reign (124/5, 128/9 and 131/2) and resided there as a private citizen from AD 111 to 113 before his accession as emperor. The philhellenic emperor did all he could to raise Athens to a special position in the Roman Empire and hoped to restore the city to the greatness of its distant past. Among Hadrian’s most ambitious projects in Athens were the completion of the Temple of Zeus, the building of a new library as well as a Temple dedicated to Hera and another dedicated to all the Gods (Pantheon). In addition, to respond to the city’s fundamental need for water, Hadrian commissioned the building of a new aqueduct. A number of panels are devoted to his building program. 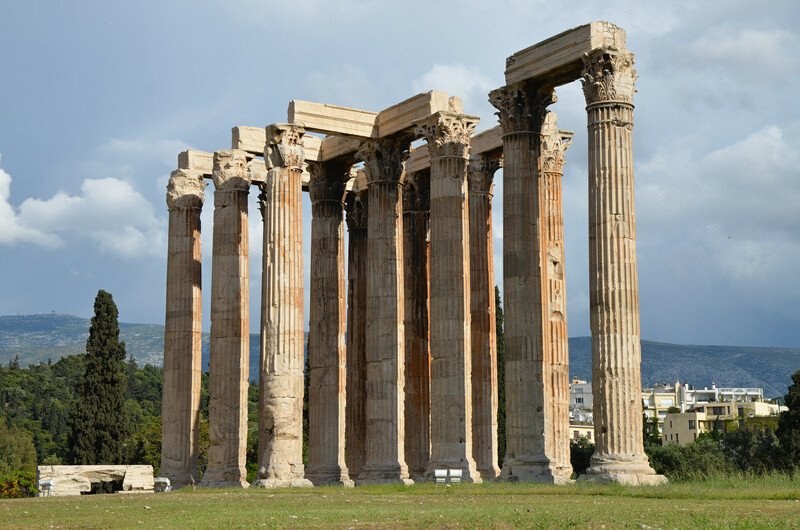 The building program of Hadrian in Athens: The Pantheon & the Temple of Olympian Zeus. One of the most iconic buildings that Hadrian dedicated in Athens was the Pantheon, “a sanctuary common to all the gods” according to Pausanias. Its remains have been partially excavated on Odos Adrianou, some fifty meters east of the Library and the Roman Agora. It housed written testimonia of the emperor’s benefactions towards Greek and barbarian cities. It was a building of religious character that probably housed the deified emperor’s cult along with that of the gods. The building program of Hadrian in Athens: The Library of Hadrian. Among Hadrian’s most ambitious projects was the completion of the vast Temple of Olympian Zeus, a project begun in the 6th century BC by the Athenian tyrant Peisistratos but soon abandoned when the tyranny was overthrown. The gigantic temple of the Corinthian order was twice the size of the Parthenon, with a surface of approximately 5,000 sq m. Its interior housed the chryselephantine statue of Zeus. Hadrian was worshipped in the newly finished temple by the name “Olympion”, as showed by the numerous inscribed altars and pedestals for statues honouring him. Pedestal for a statue of Hadrian preserved in the Olympieion (Temple of Olympian Zeus) dedicated to Hadrian in 131/32 AD by the Cilician city of Koropissos during the inauguration of the Temple (IG II² 3307). One of the most luxurious buildings built by Hadrian is the so-called Library of Hadrian. Pausanias describes it as “a hundred columns of Phrygian marble, with walls built just like the columns, and pavilions with gilded roof-work and alabaster, decorated with statues and paintings. Books are kept in them”. The structure was a multi-purpose edifice which included, in addition to the library, reading rooms, teaching rooms, porticoes for philosophical walks, gardens, a pond for recreation and perhaps the city’s archive. The building of the Library testifies to the high esteem in which the emperor held the city of Athens. It is here and not in Rome, that Hadrian chose to build the library, presenting the city with a majestic imperial forum. It is in Athens, after all, that he chose to leave a record of his life and accomplishments (Res Gestae). The north wing of the facade of Hadrian’s library with the propylon and the exterior courtyard. To respond to the city’s fundamental need for water, Hadrian commissioned the building of a new aqueduct. Its construction started in AD 125 and was completed fifteen years later in AD 140, during the reign of Antoninus Pius. The aqueduct consisted primarily of an underground tunnel at a length of over twenty-five kilometers. Archaeological remains may still be found, notably two water bridges in Nea Ionia as well as underground shafts at the Olympic Village. The Hadrianic aqueduct is not only a major infrastructure project, but also a testimony of the emperor’s will to improve the quality of life in Athens. Hadrian’s technical projects: the aqueduct, the water reservoir, the bridge over Eleusinian Kephissos. A water reservoir, with a capacity of 500 cubic meters and embellished with a monumental facade featuring four Ionic columns and an arch, was built on Lycabettus Hill. 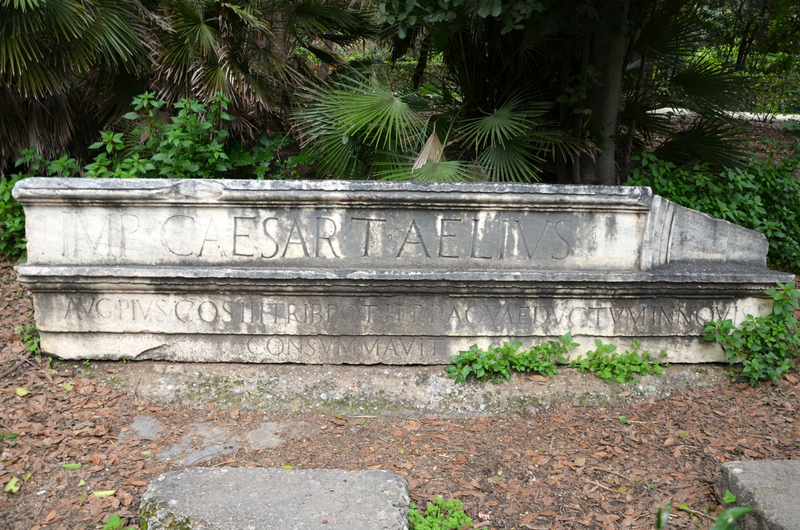 A dedicatory inscription on the architrave mentioned that Antoninus Pius completed and inaugurated the aqueduct. The left side of the inscribed architrave is kept today in the National Garden. The remains of the facade of Hadrian’s reservoir located on Lycabettus Hill. In addition, Hadrian paid for repairs of the Sacred Road from Athens to Eleusis and the construction of a bridge over the Eleusinian Kephisos. The bridge measured 5.3 metres wide and 50 metres long, spanning the 30-metre-wide riverbed. Its construction may coincide with Hadrian’s first visit to Athens as emperor (AD 124/125) and his initiation in the Great Eleusinian Mysteries. 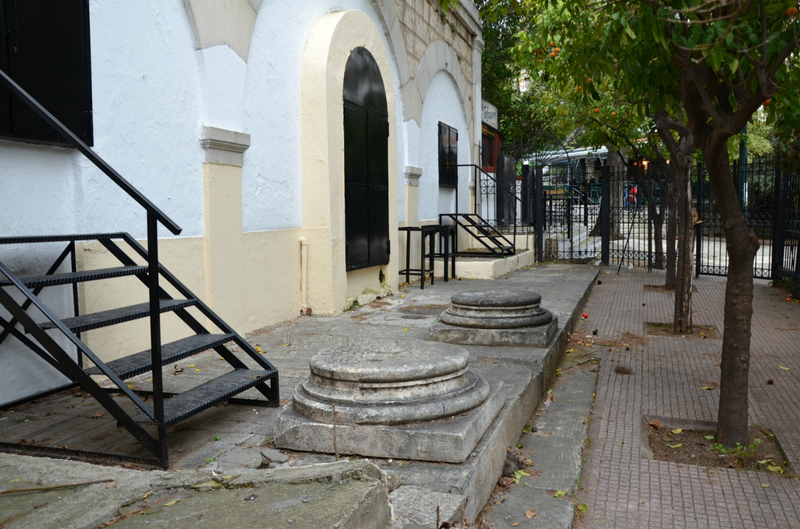 On the other bank of the Ilissos, near the Church of St. Photini, is the site of Kynosarges where the ruins of the Gymnasium, built in 134 by Hadrian, were found. In his continuous effort towards the spiritual and cultural rejuvenation of Athens, Hadrian founded -aside of his Library- a Gymnasium, having, according to Pausanias, a colonnade of a hundred columns of Libyan stone. 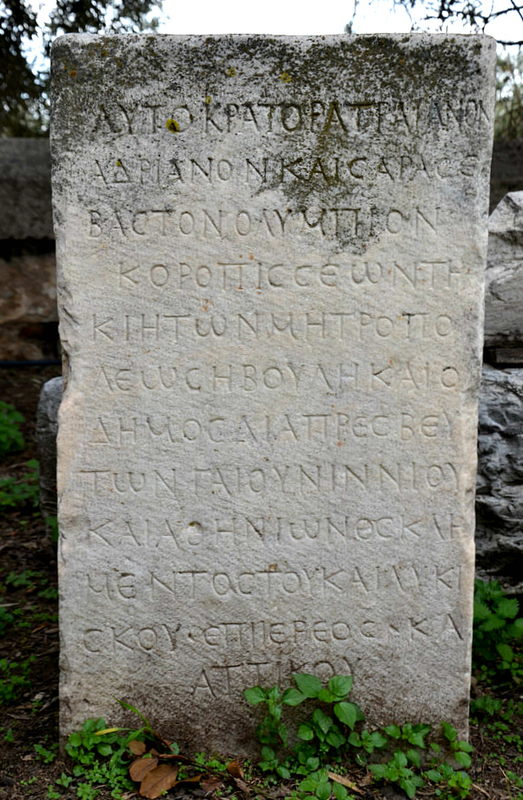 A partially preserved letter from Hadrian to the Athenians (IG II2 1102), discovered south of the Ilissos River across the Olympieion, has been associated with the remains of the gymnasium found nearby. On the letter Hadrian proclaims his desire to do well for the Athenians by announcing a gift of a gymnasium for the neoi (the young) together with supplementary funding. Another panel is devoted to the new buildings that adorned the Ancient Agora and the Roman Agora under Hadrian and his successors. Once dominating the northeast corner of the Ancient Agora square, a Basilica, of which only the foundations survive, was constructed during Hadrian’s reign. It was a large and roofed structure with three aisles, used for administrative, judiciary, as well as commercial purposes. The Ancient Agora and the Roman Agora. Other new buildings included a double Doric portico northwest of the Agora, a small circular building with eight unfluted columns supporting a dome (monopteros) and identified as a fountain, as well as a semicircular Nymphaeum that Hadrian’s aqueduct provided with water and which survives in a very poor state. The fragmentary statue of Hadrian which is now installed in the eastern part of the Agora, just under the Temple of Hephaistos, once stood on a rectangular pedestal in front of the Nymphaeum. Section of the Hadrianic aqueduct near the Ancient Agora. The new installations in the Roman Agora, the centre of commercial activity of the city during Roman times (mainly the trade of olive oil), included the eastern gate and an internal colonnade around the central court. A decree of Hadrian regulating the sale of olive oil, an important branch of Attic commerce, is engraved on the north jamb of the doorway of the Gate of Athena Archegetis which served as the main entrance to the Roman Market. The decree states that oil producers shall deliver 1/3 of their production in taxes. Its aim was also to reassure that the city would always have a sufficient amount of olive oil for sale. The top line reads KE NO ΘE AΔPIANOY: “chief points from the law-giving of Hadrian”. Decree of Hadrian regulating the sale of olive oil, an important branch of Attic commerce, is engraved on the north jamb of the doorway of the Gate of Athena Archegetis. Hadrian was a farsighted and keen politician who realised the impact of architecture on the people he ruled. It is because of this that he immediately began a gigantic building program that extended far beyond Rome, the Empire’s capital, to the provinces that also lived through a period of renaissance. Three other panels are devoted to the architecture of Athens in the years of Hadrian and show the techniques and material used for the construction of the new buildings. Pentelic marble from Greece was still used (Olympieon, Library) but other colored marbles were imported into the city from Numidia (Gymnasium), Phrygia and from Karystos in Euboea (Library’s columns). 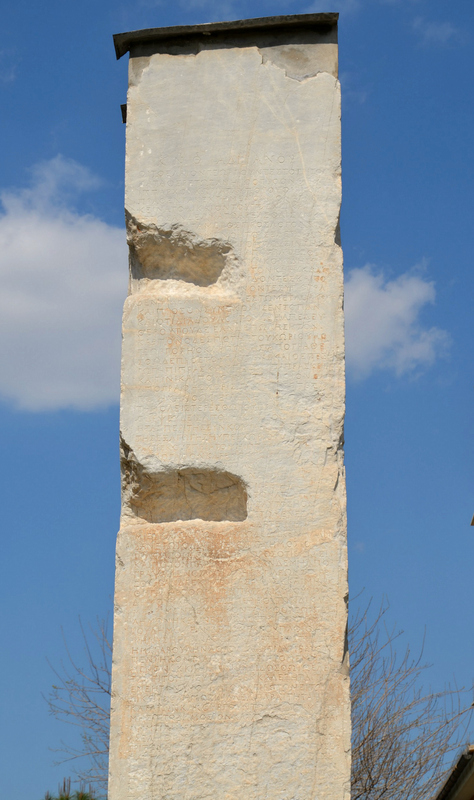 The Corinthian order was a new element in the Hadrianic buildings of Athens. They appear at the Library, at Hadrian’s Arch and inside the Olympieon precinct. Architects and Architecture under Hadrian. Hadrian was himself an amateur architect and painter with his own solid understanding and personal opinion on the architectural plans; however he entrusted their execution to his architects. The emperor oversaw personally the works and his presence contributed to the completion of numerous architectural projects. Another panel discusses the iconography of Hadrian. The headless statue of Hadrian stading in the Ancient Agora of Athens. Hadrian was particularly concerned with promoting his image to the populations he administrated through statues and coins. Another section of the exhibition is dedicated to the honours Hadrian received from Athens. Prior to becoming Emperor, the Athenians gave Hadrian Athenian citizenship and elected him archon eponymous, their chief official, in AD 112. The city of Athens honoured him with a bronze statue in the Theatre of Dionysus. Later, in order to honour his benefactions, the Athenians erected a honorary arch. There were two inscriptions carved on the architrave, facing in opposite directions, naming both Theseus and Hadrian as founders of Athens (IG II² 5185). The Arch of Hadrian, southeast side (facing the Olympeion). Hadrian was worshipped alongside the deities of the Athenian pantheon as no other emperor in Athens. Zeus and Hadrian were worshipped together at the Temple of Olympian Zeus as symbomoi theoi (sharing the same altar) where a large number of statues and dedications were displayed. More than 50 bases for Hadrian have been found in Athens, 30 of these in the Olympieion alone. Other statues found on the Acropolis and in the Roman Agora suggest that he was worshipped together with Athena and Zeus Eleutherios. Ninety-five small altars bearing dedicatory inscriptions to Hadrian were also set up in the Agora, in the Library, on the Acropolis and in the Olympieion. 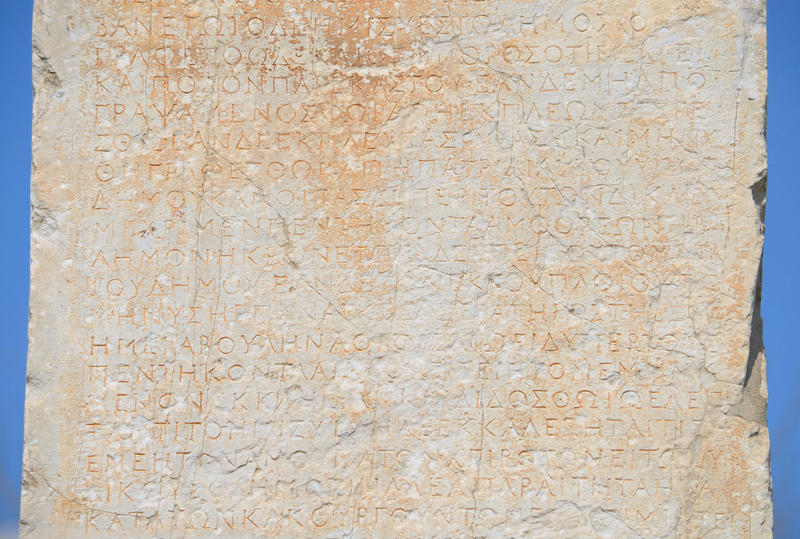 These dedications constitute a large body of evidence on the worship of Hadrian in Athens. On display are four of these altars. Small altar dedicated to Hadrian with a rider chasing a horse with bridle in relief and with the inscription: To Saviour and Founder Emperor Hadrian Olympos, AD 132. 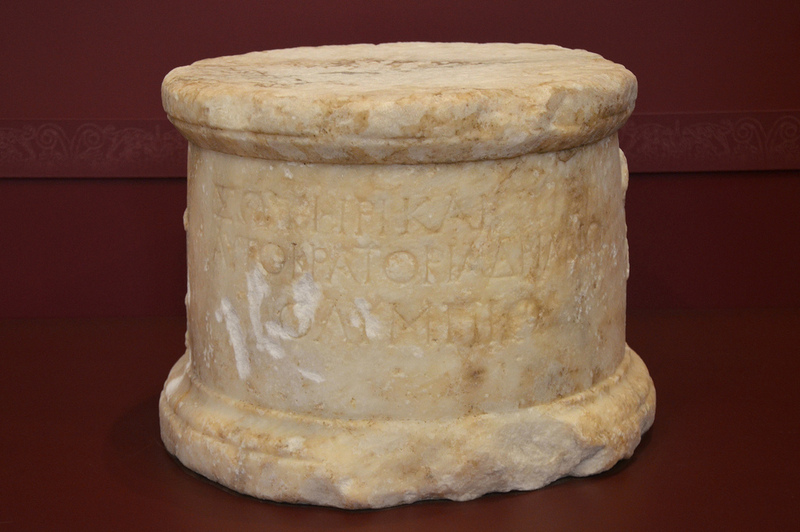 Small altar dedicated to Hadrian with the inscription: To Saviour and Founder Emperor Hadrian Olympos, AD 132. 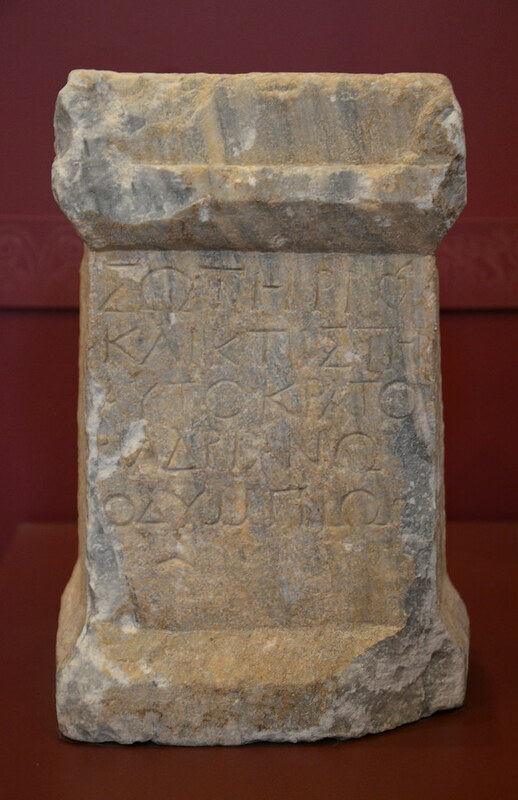 The altars took different forms but all had the same brief dedicatory inscription: “To the Saviour and Founder Emperor Hadrian, the Olympian”. This dedication was orchestrated in the year 131/2 when Hadrian inaugurated the Temple of Olympian Zeus, founded the Panhellenion and established the Panhellenia Games. 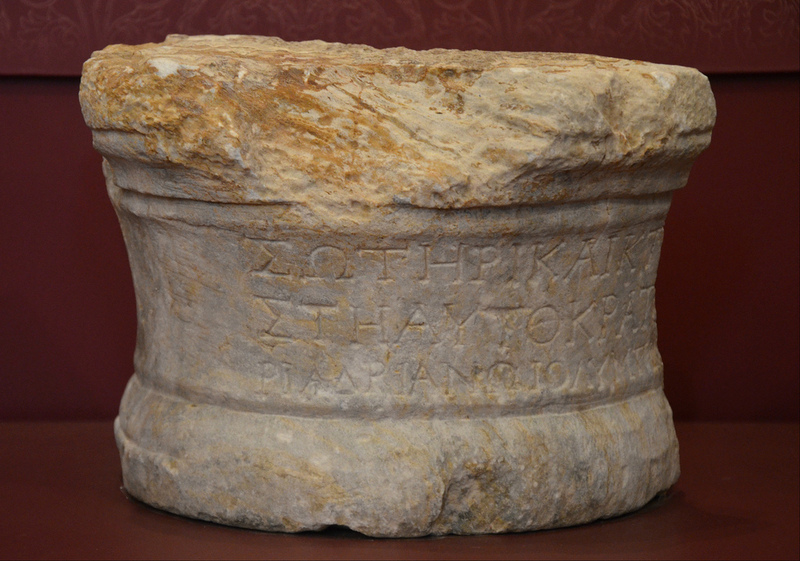 Small altar dedicated to Hadrian with a swallow hole on the upper side and with the inscription: To Saviour and Founder Emperor Hadrian Olympos, AD 132. 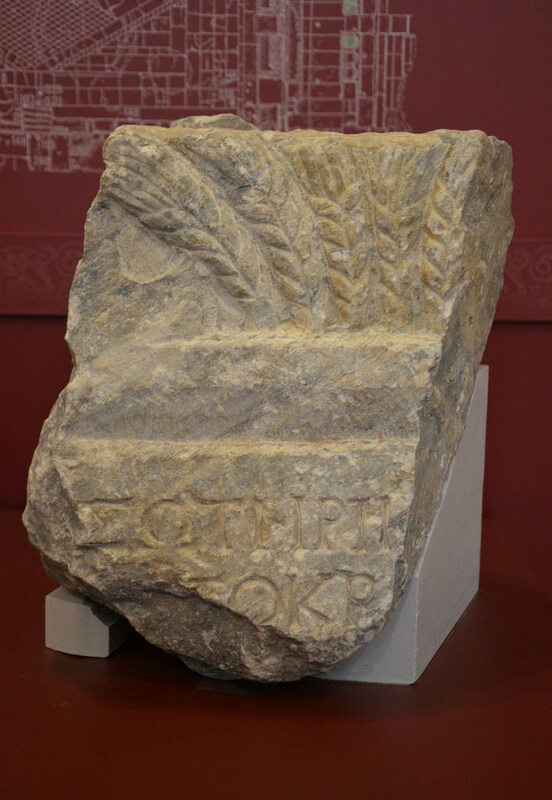 Small altar dedicated to Hadrian with wheat ears in relief and with the inscription: To Saviour and Founder Emperor Hadrian Olympos, AD 132. Hadrian also received honours as “Neos Dionysos” and undertook the financial support of the Dionysia festival, the ancient dramatic festival held in Athens in honour of Dionysus. In March of 125, he presided as agonothetes (superintendent of the sacred games) at the Greater Dionysia in the Sanctuary of Dionysos Eleuthereus. The Theatre of Dionysus on the south slope of the Acropolis. Hadrianic reliefs from the stage front (scaenae frons) of the Theater of Dionysus on the South Slope of the Acropolis. The marble head of Hadrian discovered in 1988 during the digging of a trench in Mousaiou Square, to the South of the Roman Agora, is the centrepiece of the exhibition. This head, identified with the “Stazione Termini” type, was created soon after Hadrian’s accession as emperor. It is one of the finest Athenian portraits of the emperor and probably comes from a statue. The emperor wears a laurel wreath which is tied behind the head with a broad band. The portrait may have been created during either the second or third imperial visit to Athens (124/5 or 128/9). Head of Hadrian found in Athens near the Roman Agora and usually on display in the small museum of the Library of Hadrian. Another portrait on display is a marble statuette of Antinous, probably exhibited for the first time to the public. It was found in Athens, in a cistern together with busts of philosophers. Marble statuette of Antinous from Athens. The exhibition runs until until July 31st, 2018. A the time of my visit (February 2018) the opening hours were different to those of the Roman Agora (08:00-17:00) as the Mosque was opening at 10:00 daily. To learn more about the colossal building program of Hadrian in Athens read my post “Exploring Hadrian’s Athens“. Thank you for your wonderful and interesting posts. Hope to see the exhibition myself. Great article! My hat is off to your scholarship and your diligence! Great article as are all the things you write in Following Hadrian. I applaud your diligence and scholarship. I pray that you will have the determination to carry Following Hadrian through to 2038. I also will hope to visit this exhibition in Athens in the late spring. I am so glad to find your site and your write-up about this exhibit! I spent nearly two hours in the exhibit earlier in June and was sorry there wasn’t a printed summary available to buy. I hope I can find the full text of the panels (the English text, anyway) somewhere. Your overview and summary and references are wonderful! Thank you! The exhibit is very cool.